(July 2010, Romania) – guest post, by Johnny H.
Hi fellas ! I’ve dropped by in Cluj to a buddy of mine, but hey, he wanted to show me the country, said that Romania has lots of great spots to see – mountains, pastures, rivers and stuff, and also castles, monasteries and the like… So I’ve said, what the hack, let’s go for it. Weather was good, the first sunny weekend after many rains, so my buddy gathered some friends of his, boys and girls, we jumped into the cars very early Saturday morning and headed south. First stop was the small city of Sebes. Seemed like a nice cosy town, with some medieval traces clearly visible in the centre, but we were bounded for „Rapa Rosie” so could not see of the city this time. 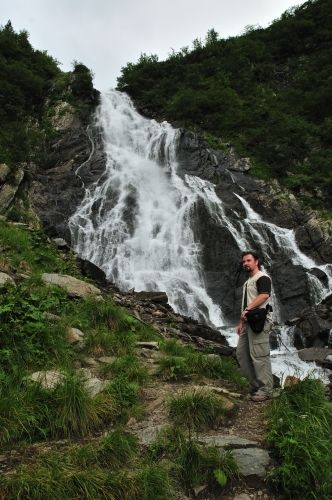 They say that „Rapa Rosie” is a unique natural phenomenon in Romania. Well, if that’s true, I find it hard to understand how come there is no signing to the place and we had to ask around to find our way. Just for you to know – drive by towards Daia Romana, then turn left just after the military barracks. It’s just a dirt road, unmarked, winding through the plain. 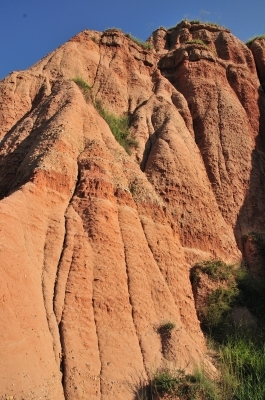 „Rapa Rosie” is an example of the „badlands” phenomenon, as you see in the pictures. Not that big, would be clearly dwarfed by the ones from South Dakota or Utah, but it’s pretty neat for Romania. We were in a hurry, with a long way ahead of us that day, so did not have much time to play around. Due to the strict plan, we had to interrupt the fun of some of our comrades, who’ve heard from somewhere that there are dinosaur bones in these eroded crevasses and were trying to dig up some prehistoric teeth and bones to bring home. Well, no luck this time, since we’ve rushed down the hill to go to the next objective. So, next, was Calnic. Right in the middle of the village we’ve found the medieval fortress, build some 700 years ago and shelter for the Saxon community for many centuries. 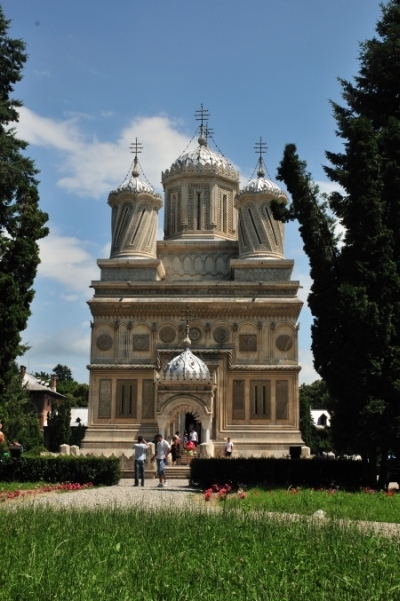 It’s part of the UNESCO Heritage sites and quite good preserved, well taken care of by a foundation from Cluj. 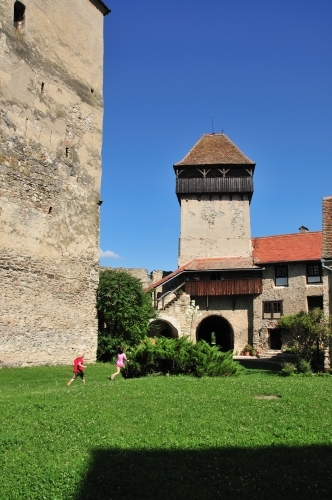 While we were here, a German family was studying their maps in the courtyard, the children running around everywhere. Probably looking upon their ancestry, however, giving us the glimpse of old times… You can really feel the history there, under the old walls. Further we went, and at some point we turned right towards the mountains. Towards Balea. 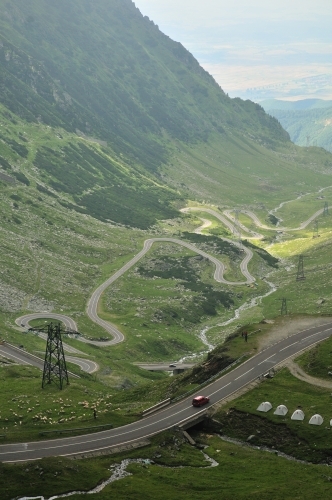 We’ve entered an epic road – the Transfagarashan. That’s what I’ve been told by the other people in the car, all excited about it. 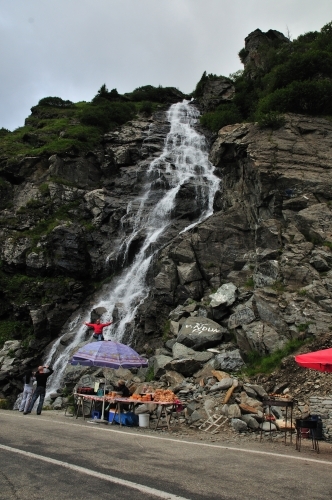 Especially the driver, as they all say that’s quite an experience to drive this road, which crosses the highest mountains in Romania, the Fagaras, at over 2,000 meters of altitude. 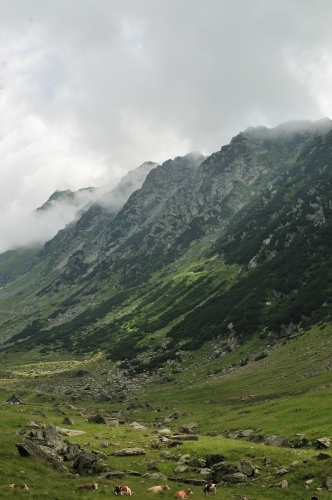 Not too far above, as we’ve passed the forest and entered the big expanses of glacial valleys, there was another image which I like to see as specific to Romania: high peaks in the clouds and cows grazing in the valleys – so serene and spectacular. Oh, you say that the Swiss have that also – I’d like to remind you that their cows are purple, as you’ve clearly seen in the commercials. 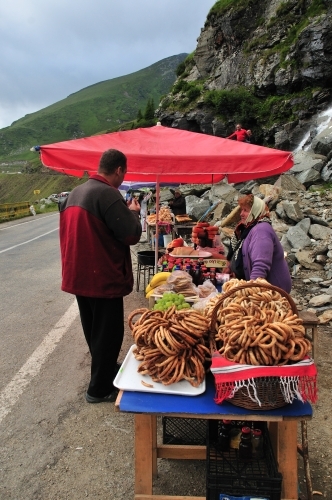 And soon we were in the highest point of the road, at over 2000 meters, near the Balea glacial Lake. Surrounded by thick layers of fog, in the cold air contrasting with the sun and warmth that we left bellow in the valleys, it is quite something to see and touch the snow, in the middle of July. 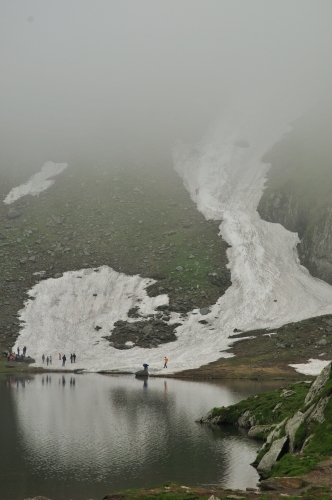 Others were even more excited, as we saw a brave skier climbing diligently on the steep icy slope (you see him in the picture bellow, on the left of the snow field, just before vanishing into the clouds). We’ve eaten at the cottage situated on a peninsula on the lake, then headed further South, through the longest road tunnel in Romania (over 800 meters long). Just getting out from the tunnel on the South side of the mountains the weather was sunny and warm again. The twisting road is dotted with small merchants, so we’ve stopped in a popular spot (near a very nice falls) and some of us checked the merchandise and the prices. Quite a wide offer – home-made sausages and smoked cheese were the staples, but bananas and pretzels, or gemstones, wooden souvenirs and fur hats are to be found as well. Since one of us wanted to buy some „tzuica”, we’ve started walking from one merchant to another to inquiry about the price and quality of the liqueur. The Tzuica is an institution in Romania and everyone seems to e a specialist. The smell, the aroma, the strength, the type of fruit from which it comes, the colour, the small pearls that it makes when you stir it – all are marks of judgement for the connoisseur. But you can’t determine the good stuff unless you taste it, so walking around the stalls also means a lot of tasting, for free – sips of tzuica from the caps of the plastic recipient, to judge the quality. As my buddies say, the price asked by the merchants is outrageous – 40 lei a litre. „Hey, look where you are! In the top of the mountains! What are you expecting?” – that’s the answer of the sellers 🙂 But a better price could finally be obtained, and we rushed back to the cars, happy after sipping well flavoured tzuica, although clearly not so strong as the one that my friends gave me to drink in Cluj the day before. The day was slowly coming to an end, thus our concern began to find a good place for camping before reaching the Vidraru dam. However, finding a good spot proved to be quite a challenge, as there is a shortage of side roads until you reach the big lake and the only suitable spots are on the side of the road – not the greatest option, but you can’t be very fussy in the given conditions. We’ve found a place, camped and made a fire to cook the meat bought from Sibiu, to sip a beer and talk about the day, the plans for tomorrow and lots of other stuff that people usually talk around a camp fire. Someone scared us that there are lots of bears in the surrounding forests, so we were pretty serious that the boys should take turns during the night, to watch near the fire and protect the rest from the wild beasts. Sadly, the rain came down and poured with resilience all night, so we had to eat some pieces of rawish meat, clearly undercooked, cut short the beer drinking and storytelling and go in the tents, leaving the fire to die under the rain and the bears to roam free in the forests – they are not stupid to come to us when it pours like this, right? The morning came, a sunny morning, announcing another beautiful day, so we broke camp in haste and drove down South again. 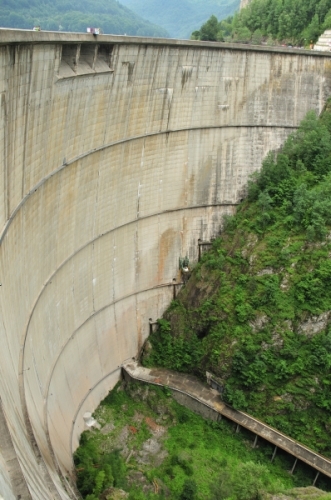 The Vidraru Dam, a huge concrete structure, was our first stop for the day. With 166 meters high, looking down from the arch dam gives you some moderate chills, but one can only imagine what you would feel before bungee jumping from the platform situated in the middle of the dam. The jumping site was deserted now, thus could not see the leaps in void, nor try it ourselves today (some of us really expressed their regret, but sometime we’ll be back, just for this thrill). 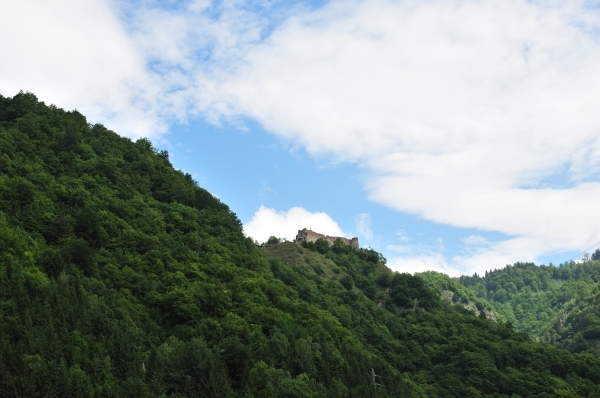 Next stop, not too far down from the dam, was the Poenari Castle. Perched high on the cliffs above the Arges valley, the castle is one of the main strongholds of Vlad the Impaler, the historical figure behind the legend of Dracula (naturally, the „real story about Dracula” is something that you learn in the first day of your trip to Romania, as it seems all the people here are eager to dismantle the western myth). Climbing to the castle takes 1480 steps through the forest, a worthy climb, as the landscape opens in front of you from the top and you get the chance to imagine how it was to be one of the 5 defenders some 6 centuries ago. 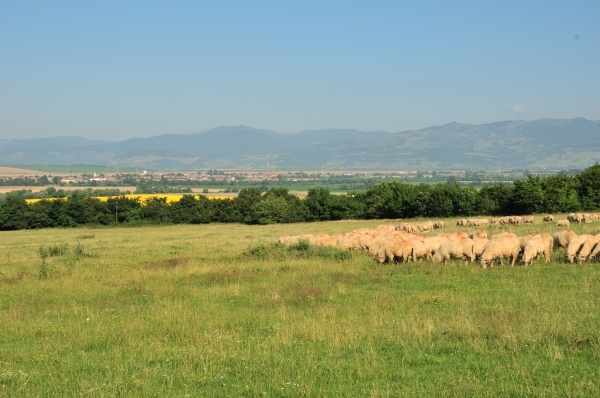 We’ve left the mountains, winding now through the hills and villages of the county of Arges, towards one of the oldest cities in Romania, ancient capital of the country of Wallachia, as its name itself says – Curtea de Arges – the court upon the Arges river. It’s home of ancient palaces and churches, of which one certainly stands out – the big cathedral from early 16th century, a work of art and cradle of legends for centuries. The beautiful cathedral is surrounded by various other buildings, as this was a big monastic complex and still is a religious centre. Peculiar for me was the volume of commerce happening inside the walls of the complex. From the entry gate you see stalls showing various things – books, crosses, pendants, rosaries, statuettes and other souvenirs, „holly bread”, candles. In some parts you feel like in the bazaar, crowded by merchandise and buyers in the corridors, just that the sellers are placid and the bargaining is done in whisper. These lands just south of the mountains were clearly filled with spirituality in the middle ages, as not far away, about 30 km towards the city of Campulung, we’ve reached another ancient monastic complex – „Corbii de Piatra”. 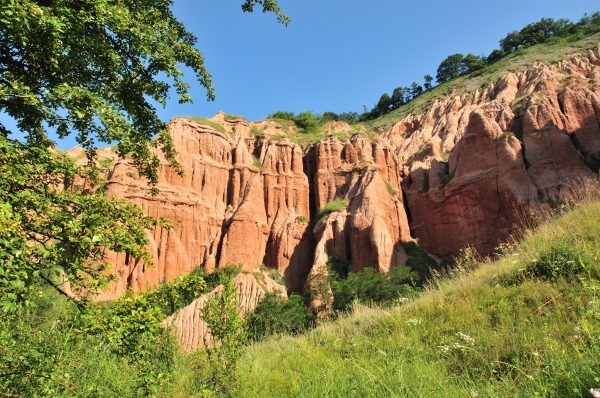 The monastery was carved in the sandstone wall in the 14th century. A long refectory was chiselled, visible on the right side of the church entrance – a place of congregation for the ancient monks. The smoke of the old fires, which cooked the food for the hermits, is still blackening the roof. The inside of the church was painted in the ancient times, but centuries of high humidity and temperature variations have damaged the images, which are hardly visible. One can feel the remoteness of the place, the silence and the relaxation – there were no other tourists there, just a priest acting more as a door keeper and souvenir vendor, too bored to tell us the stories of the church – so that was frustrating, because places like this are revealed through stories told there, not through scraps found on the internet or on flimsy cheap brochures. Someone else though would have been able to tell us stories – stories gathered in over 80 years of leaving next to the big rock and the ancient monastery. Mama Uta has a small house right near the church complex. We’ve found her on the porch of her very old house, made of adobe long time ago, traditionally painted in dark blue and adorned with flowers. If I would know Romanian and if we would not have been in a hurry to get back home, I am sure we could have heard lots of stories. But time was running fast and we were a long way from Cluj, where we should get that night. A long but beautiful road was waiting for us, as we drove along the valley of Olt, one of the biggest rivers of Romania, through a spectacular landscape between the mountains. 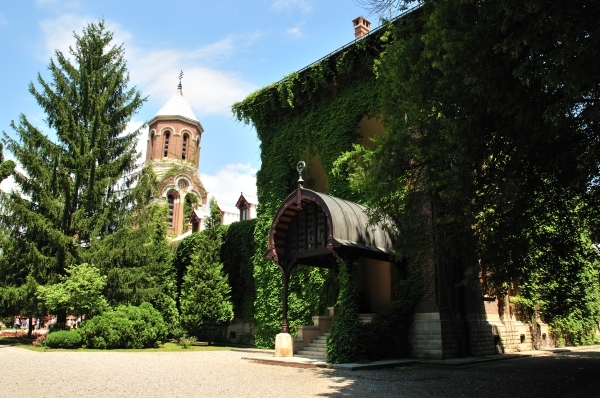 Only one stop we took, at dusk, at Cozia monastery, build in the 14th century by the ruler of Wallachia, Mircea the Elder. The church still preserves some parts of the original frescoes. The fountain on the front-right side was build later, but it’s said to be special – if you drop a coin in there and make a wish, it will come true, especially if afterwards you drink a glass of its water. So people, kids and elders, gather around the fountain to make wishes – that’s a recipe that will work always, everywhere. There was no stop from Cozia until Cluj, except for gas, snacks and a Red Bull for me, as I was already sleeping in the back of the car and did not want to be the only one who dozes while the others are alert. The poison gave me 5 minutes of wide awakeness, then I felt back into the mists, between thoughts and dreams, about the places, the people, the feelings of this country, about the joy of discovery and the freedom of being on the road, with no expectations, just with the open heart. Pot sa scriu si eu o relatare cu aventurile ce urmeaza acasa? Impresipnante povestile din Africa !!! As vrea si eu sa merg intr-o excursie de acest gen dar nu am cu cine…. Am umblat cat mi-a permis timpul pana acum … vreo 20 de tari insa nimic prea periculos… Esti interesat de „tovarasi de drum” cand mai pleci? Congratulations! You were in amazing places and you caught very well the spirit of them. I appreciate when somebody, from another country, seeks such places and tries to understand my country. Africa in general nu e periculoasa, cu mici exceptii. Doar trebuie sa fii mai atent, mai deschis la experiente diferite si la privatiuni de tot felul (mofturile la mancare, cazare sau transport pot costa foarte mult). Suna foarte interesant si tentant! Nu cred ca as avea probleme de genul mofturi pe acolo singura problema este sa imi iau concediu de la munca, dar voi cauta solutii. Cam care este bugetul? Eventual as venidar pe o perioada mai scurta… sa plec odata cu tine si sa ma intorc dupa craciun eventual?! Ardelenii sunt oameni seriosi… daca am zis am zis… A fost o experienta tare de tot… Merci Daniel, fara „guidance” era destul de dificil pe acolo pt mine de unul singur si sper ca ne mai intovarasim pe Africa sau alte meleaguri de pe mapamond ! !